“3DPDF Exporter For Autodesk® Revit®” exports solid bodies to a 3D PDF file. Have you ever felt the need of converting your model to a PDF document? Or share it with anyone easily? The 3D PDF Exporter for Revit® does it for you. Option to control the file size and quality by specifying the precision value. There is always a default compression which helps reduce the file size as much as possible. 4.2.0.0 11/15/2018 Enhancement : Export Views from Revit in 3DPDF. Enhancement: Allow the user to disable any user selections in 3DPDF. Enhancement : Support for Default tessellation. 4. Fixed: PDF attachments were not exported if templates are used. 4.0.0.0 05/29/2018 1. Enhancement: Added support for Autodesk Revit 2019. 3. Fixed: Colors were not getting exported for specific models. 3.1.0.0 03/8/2018 1.Feature: Added support for the user-defined page size of 3D PDF. 2. Fixed: Rebar entities were not exported. 3.0.0.0 07/21/2017 1. Update: Added support for Revit 2018. 2. Update: Updated technical support contact details. 2.4.0.0 10/20/2016 1. Feature: Added ability to export Revit Link model. 2.3.0.0 10/05/2016 1. Supported Revit version 2017. 2. Feature: Option to disable measurement tool in exported 3D PDF. This helps protect your model IP. 3. Feature: Option to add external files of any format(e.g. quotation, specs etc.) as attachments in exported 3D PDF. 4. Fixed: Problem of colors not getting exported for some models. 1.7.0.0 10/14/2015 1. Greatly simplified license activation process. 1.6.0.0 07/29/2015 1. Fixed issue with license activation. 1.5.0.0 06/08/2015 1. Added support for the hierarchical model tree into PDF. 2. Added export of property information for every element. 3. Fixed: Measurement units now reflect correctly. 4. Fixed: Accuracy of element selection in exported PDF model. 1.4.0.0 04/20/2015 1. Supported Revit version 2016. 1.3.0.0 02/20/2015 1. Enhanced: Reduction is the output file size by magnitudes (by 10+ times). 2. Fixed: Transformation for wire bodies. 1.2.0.0 02/09/2015 1. Added instancing support (reduces exported file size). 1.1.0.0 11/11/2014 1. Fixed: User who has different local settings (e.g. comma character as the decimal separator) can now export valid PDF files. 1.0.0.0 06/13/2014 1. Supports colors. 3. Creates encrypted and secured pdf files. We are supporting body and face level color and also some types of textures in this version. 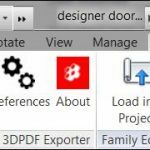 Download and install 3D PDF Exporter plugin for Revit®. There’s a new menu named as ‘Prototech 3D PDF Exporter’ in Add-Ins tab of ribbon bar. It contains following three menu items as shown in the image below. This plugin available on Autodesk store too 3D PDF Exporter for Revit. It was a true pleasure working with the team at ProtoTech Solutions. The team is extremely knowledgeable in 3D formats and DCCs, and very responsive and professional in all interactions. They did a great job developing our plugin for Revit, and I look forward to working with them on future projects. I love ProtoTech's 3D PDF exporter for Revit. This was the best investment that I have made.